Welcome to the 53rd annual O.N.A. Convention page. 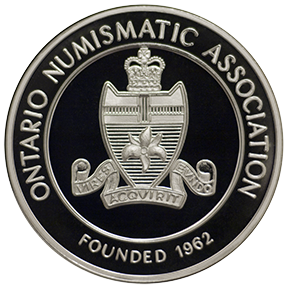 Our 53rd annual convention is now part of the ONA's long history of service to numismatics and our membership. We would like to thank our members and guests who attended and our long list of volunteers and committee members who made it a success. We invite you to attend our next convention held at the Holiday Inn - Kitchener in 2016. Niagara Falls has changed remarkably over the years and is now one of Ontario�s largest tourist destinations. 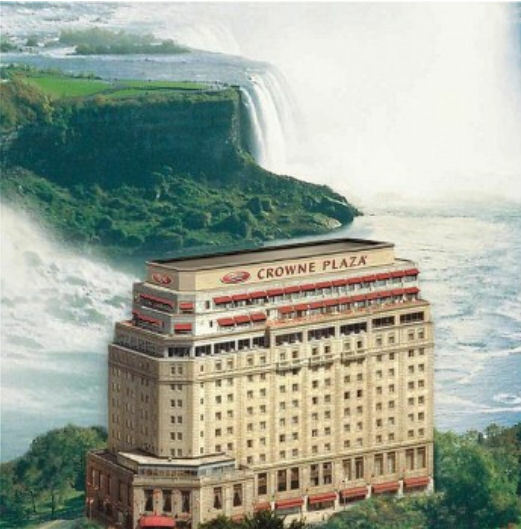 The convention will be held at the Crowne Plaza hotel which has great views of the falls. Also a history note, the Crowne Plaza was built in 1929 and was called the Hotel General Brock, named after Sir Isaac Brock "The Hero of Upper Canada" the famous general who defended the Canada from the Americans in the War of 1812. To get the most of the convention and coin show there really is no better way than purchasing a registration kit. Since 2012 enhancements have been made to a long standing service tradition of giving back to the O.N.A. supporters, members and collectors such as offering a �no frills� weekend Bourse Floor Pass and souvenir copper medals as separate items. Advance registration provides far more benefits than just paying the daily Bourse admission and attending the many free events planned for Saturday and Sunday. Get the VIP treatment with the exclusive Friday kick-off consisting of the Bourse preview and rub shoulders with registrants and dealers at the welcome reception! Bourse access before the general public affords pass holders and registrants the luxury of being among the first on the sales floor while also freeing up precious time to participate in activities, socialize and attend important club and association meetings. Although on-line registration is now closed additional passes, a small number of Banquet tickets and a selection of past souvenirs medals will be available at the sales desk while supplies last. Our 53rd convention medal design was chosen by the convention committee from a design submitted by Brent Mackie. 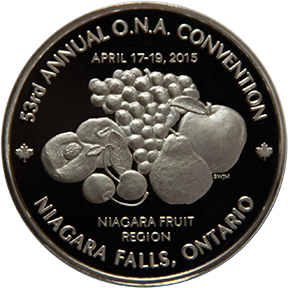 The medal commemorates the Niagara Fruit region of Ontario. Vanessa Stergulc joined the Bank of Canada�s Ontario Regional Office in January, 2008. In this capacity, she promotes the Bank and its currency function across Ontario and delivers its products and services to key stakeholders. She is also involved in the Regional Office�s program to increase public awareness of the anti-counterfeiting features of Canadian bank notes. Vanessa is a graduate of the University of Guelph, with a degree in Commerce. She has several years of experience in the financial sector, as well as past experience in the Toronto Agency Operations Centre. Bernhard (Bernie) Wilde spent his youth in Hamburg Germany and Chicago Illinois. He was educated in Niagara Falls Canada, at the University of Chicago, and at the University of Arizona. He is presently a semi-retired Fellow at the Los Alamos National Laboratory in New Mexico. As a physicist, he performed high-energy-density experiments at high power laser and pulsed power facilities to validate simulations of astrophysical phenomena and inertial confinement fusion. Bernhard has been collecting banknotes and associated ephemera for the last 25 years. One of his numismatic specialties is the 19th century intaglio engraving and printing process for obsolete US and chartered Canadian banknotes. These studies include all the illegitimate machinations of contemporary counterfeiters. Today we will hear about his study of the history of the Niagara Region as seen through the banknotes, stocks, and bonds of the world. Scott Douglas was born in Toronto, Ontario in 1952 and after completing his education began work on the trading floor of the Toronto Stock Exchange in 1972. Later, he became a professional securities attorney and is presently a market maker for Toronto Stock Exchange list securities. Scott has written numerous on numismatics that have been published in various club journals and newsletters. Scott is currently the President of the Canadian Numismatic Research Society and is a Fellow of the Royal Canadian Numismatic Association, the Ontario Numismatic Association and the Canadian Numismatic Research Society. Scott sits on the board for the Canadian Association For Numismatic Education and the J. Douglas Ferguson Foundation. This past summer Scott had the privilege of being selected to speak at the Royal Numismatic Society of New Zealand�s 1st International Numismatic Conference, representing the RCNA and North America. This years auction will be conducted by Jeffrey Hoare Ltd.
Banquet Speaker - Our Banquet speaker this year is Sherman Zavitz, Niagara Historian. The following events are taking place specifically for Youths (under the age of 17) members and visitors to the O.N.A. convention. The Coin Kids Auction was a great success last year. Let's do it again this year! located in the King George Room on the 5th floor. Why not maximize your enjoyment of the convention by registering as a convention attendee. The Junior Registration Kit, containing many great items, is just $5.00! You can't go wrong! Registeration for the 2015 convention is almost closed! For further information please contact our 2015 Exhibits Chairman, Colin Cutler, by email at this link.